As its National Poetry day I thought it was the perfect time to tell you about our poetry inspired Bronze Arts Award school project. Earlier this year we were lucky enough to receive Partnership for Excellence Arts Award funding from Arts Council England. Arts Award projects encourage young people to develop their own arts practice. Lots of museums throughout the UK are partnering with schools and other youth organisations to deliver projects. You can find out more about Arts Award here. We’re using our funding to deliver an exciting Bronze Arts Award project called ‘Communicating Conflict’ with a year nine class from Haverstock School in Camden. The students will work towards the Arts Award in their English lessons. 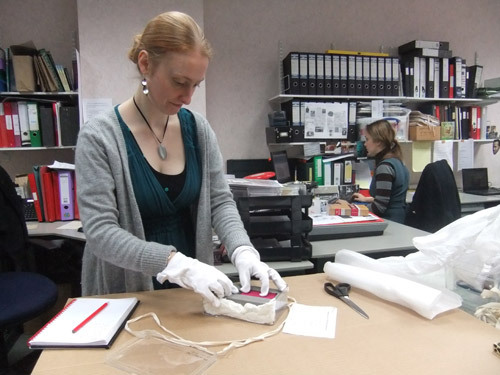 The project will encourage students to make connections between the war poetry they’re studying in school and the First World War stories and objects in our collection. Throughout the project the students will work with the fantastically talented performance poet Joelle Taylor. Joelle will run a series of workshops to support the students to develop their drama, storytelling and writing skills. We held the first two workshops last week. Joelle’s workshops are just part of the busy programme of Arts Award activity. The students will pay a visit our museum store and archive to explore our wartime collections. They’ll also take part in theatre workshops with the Big Wheel Theatre Company and will meet a contemporary war poet. These experiences will inspire the students to write and perform their own poetry. In the coming weeks the students will be blogging for us. Stay tuned to hear more about this exciting project in their words. Last Post: Remembering the First World War, an exhibition curated by the BPMA and the Churchill Museum & Cabinet War Rooms, is once again on tour. 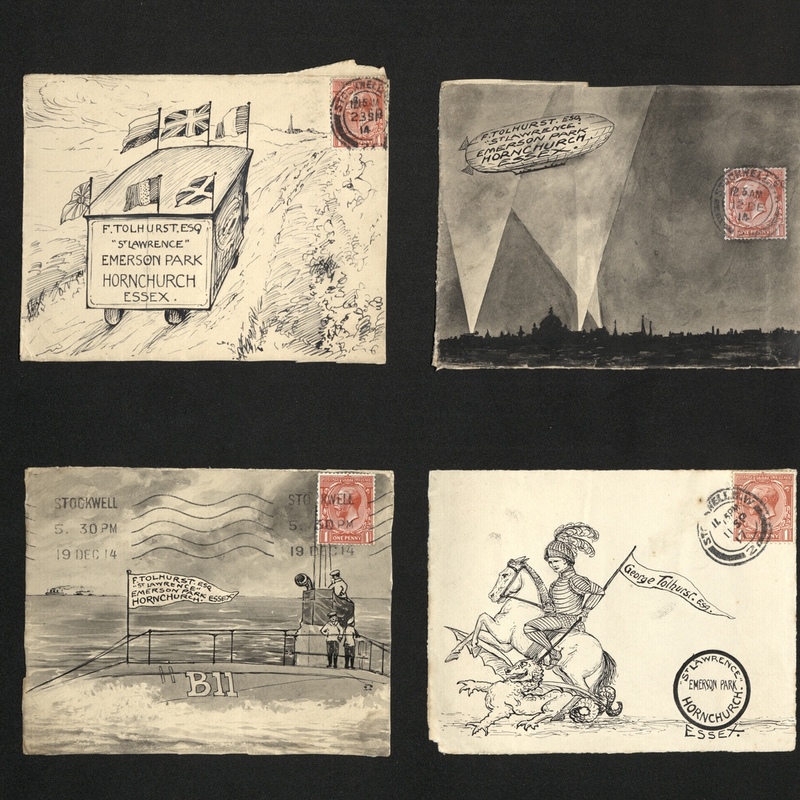 The exhibition explores the vital role played by the Post Office during the First World War, telling the stories of postal workers at war and on the Home Front, and examining the essential role played by postal communications. Last Post is currently on display at two venues, the Museum of Army Flying, Hampshire, and the Andrew Carnegie Birthplace Museum in Fife, Scotland. Later this year it will travel to the Guildhall Library, London, and Bletchley Park, Buckinghamshire. The Andrew Carnegie Birthplace Museum is a particularly apt venue for this exhibition on wartime communications. While Andrew Carnegie is best known for using his huge fortune to build libraries and cultural venues, and found the Carnegie Endowment for International Peace, in his early years he worked as a telegraph messenger. At the aged of 13 Carnegie emigrated from Scotland to Pennsylvania with his family, securing a job two years later as a telegraph messenger boy at the Ohio Telegraph Company. Carnegie was quickly promoted to telegraph operator, but left aged 18 to work at the Pennsylvania Rail Road Company. By the time he was 20 Carnegie was investing in railway companies and learning about how they were managed; he was later to become rich through investments in the oil and steel industries. 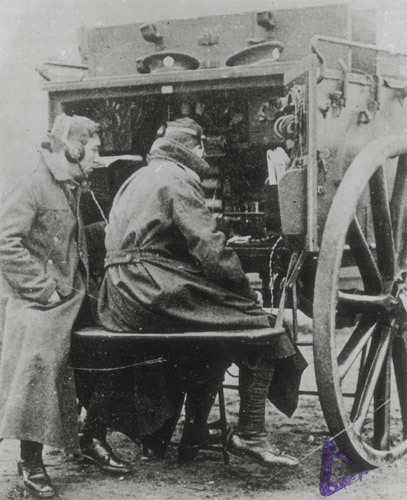 In the 19th and early 20th centuries telegraphy was an important – and the fastest – means of communication, and Post Office telegraphists were vital to wartime communications. Last Post: Remembering the First World War examines the impact of telegraphy on the war, and includes rarely-seen images of frontline telecommunications from the BPMA and Imperial War Museum’s collections. Visit our website to see the tour dates for Last Post: Remembering the First World War. Andrew Carnegie’s life was commemorated on a United States postage stamp in 1960 – see it on Flickr. A few weeks ago we were very fortunate to have a visit from someone wishing to donate a group of material to the BPMA museum collection. The group of material related to a Thomas William Ernest May, the donor’s father. We have subsequently been able to trace something of his Post office service through the Archive records. May joined the Post Office in 1910 as an Assistant Postman and just a couple of years later, in 1913, was appointed as a Sorter at North District Office in Islington, very quickly transferring back to his old role as postman but at the North West District Office. Just one year later with the outbreak of the Great War as it was known, Thomas, like many other Post Office workers, joined the 8th Battalion London Regiment known as The Post Office Rifles at the age of 20. He later returned to work at the Post Office, rising to the rank of Assistant Superintendent by the time of his death in 1953. The objects donated to the BPMA relate both to May’s time in France with the Post Office Rifles as well as his Post Office work. Amongst these are several very personal objects, including a green leather bound pocket journal given to May before he embarked for France in 1915. It includes a map of Flanders, various helpful French and German phrases, a calendar for 1915 and different methods of working out your position in day and night: all to aid the soldier should he get lost or separated from his battalion. The journal itself is written by Thomas in pencil and covers his posting to France as well as his thoughts and feelings in the midst of campaigns on the front line. 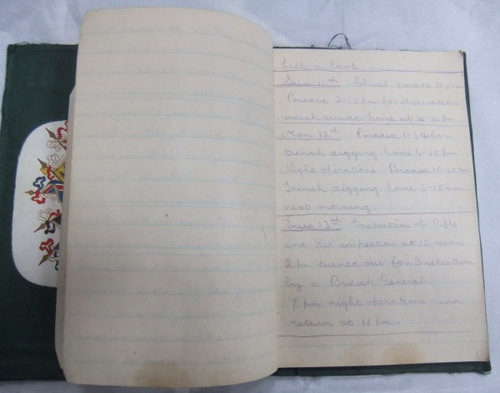 We are hoping to work on a project to scan and transcribe this journal to chart May’s time during the war, so do look out for that on this blog in the coming years, as well as many other items relating to the Centenary of the Great War. Journal given to Private Thomas May before leaving to fight in France with the Post Office Rifles. There are also photographs of May with other members of the Post Office Rifles, both in official uniformed shots as well as more informal photos of them with their brooms and rifles. May received the 1914-1915 Star Medal and the British War Medal, both campaign medals routinely given to those who served and they are also included within the collection as is the slightly more unusual Silver War Badge. The Silver War Badge was given to soldiers who had to return from the war due to injuries, the badge states ‘FOR KING AND EMPIRE SERVICES RENDERED’. It was to be worn on civilian clothing and was proof that they had been honourably discharged and meant they could avoid being given a white feather for supposedly shirking their duty. Photograph of Sergeant Thomas May. As previously mentioned, May returned work at the Post Office following his experiences in the war and the final object of this blog dates from 14 March 1929 when he was still at the North District Office. 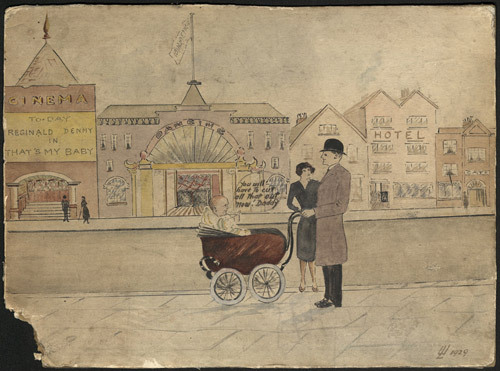 It is a large hand-illustrated card in the form of a postcard and shows a man pushing a child in a pram on the front in a street scene with a cinema and dancing hall in the background. The caption reads ‘You will have to cut all that out now! Daddy’ and features ‘Hearty Congratulations and Best Wishes from NDO’ on the birth of his daughter, who has now generously donated these objects to BPMA. Illustrated card sent to Thomas May by colleagues at NDO on the birth of his daughter. This is such a wonderful group of personal items relating to Thomas Ernest William May and we are very grateful to his daughter for donating them so that Thomas’ story can be added to the others told through our collection. Last week we invited the public to venture off the beaten track and explore the treasures of our Museum Store at a special after-hours event as part of Museums at Night 2013. 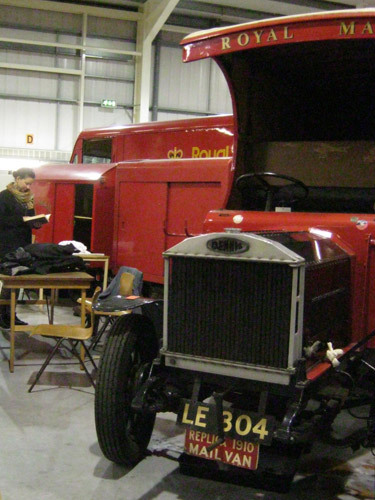 Our Museum Store houses a wonderful collection of the BPMA’s larger exhibits including vehicles and letter boxes. 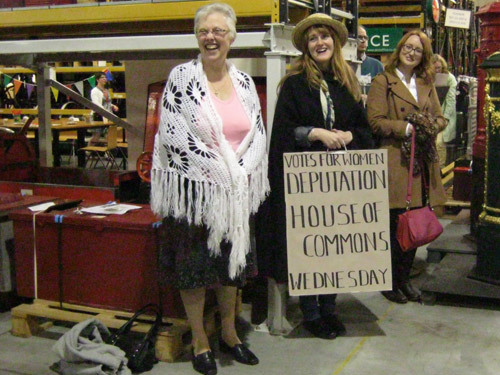 These objects and the stories they tell were brought to life by the Big Wheel Theatre Company in the guise of a suffragette “human letter” and a World War I soldier postman. Visitors also had the chance to get crafty in workshops with Craft Guerrilla, see our new “Blitz Hill Box”, which contains artefacts from World War II, and indulge in some tea-party style refreshments. Scroll down to view photos from the night. Before Museums at Night we asked you to guess ‘What’s in the suitcase?’ All was revealed at our Stories from the Store event on Thursday 16 May. 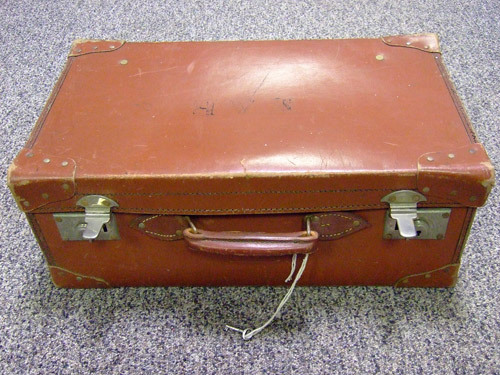 The suitcase opened to reveal the story of how the post office went to war. In 1939 the General Post Office was the biggest employer in the country. It played a vital role to keep communication going on the home front and abroad. 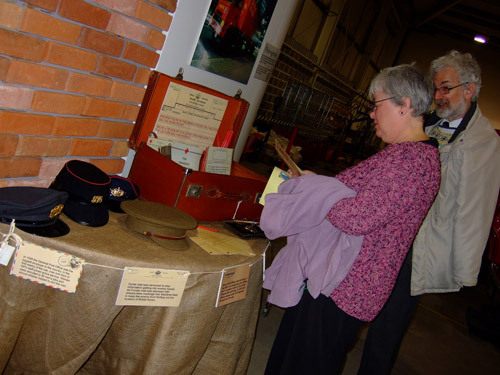 Two visitors explore the suitcase, and share their memories of the ‘Save for Victory’ campaign. This public appeal encouraged people to save for the war effort. 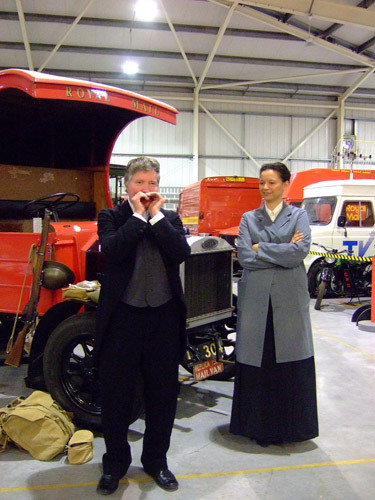 Throughout the event stories from the postal past were brought to life by Roland and George from the Big Wheel Theatre Company. Roland and George enlisted help from the audience to tell the story of the ‘human letter’. In 1909 two suffragettes ‘posted’ themselves to 10 Downing Street. The suffragettes took advantage of a clause in the postal regulations which allowed an individual to be delivered by express delivery. 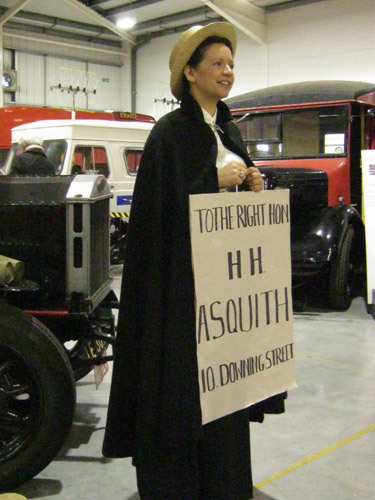 Their aim was to gain publicity for the campaign to gain the vote for women. 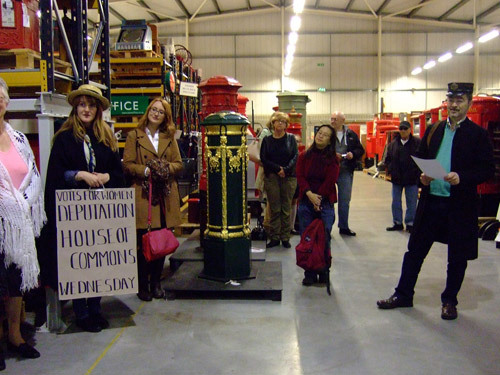 An audience member takes on the role of the unwitting post boy charged with delivering his human letters to the prime minster. The suffragettes were intercepted by a police constable who insisted the ‘letter’ had to be returned to the office of the Women’s Social and Political Union. 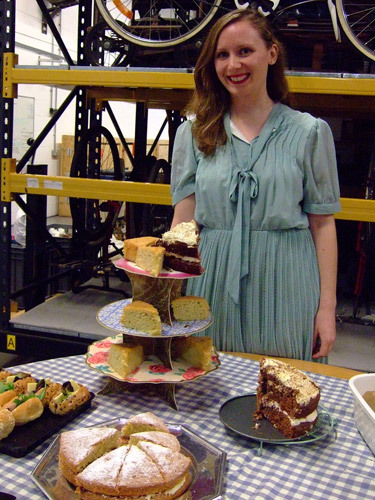 After all that acting, our visitors were invited to a tea party, with complimentary refreshments served by Hannah, our glamorous Community Learning Officer. 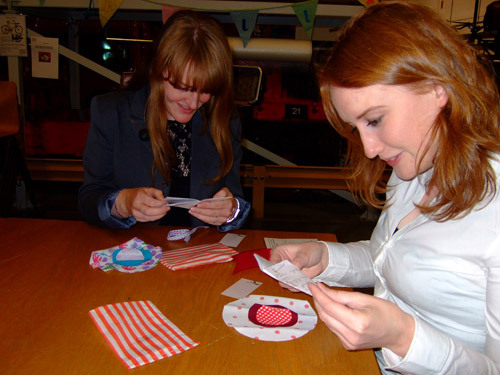 Craft Guerilla were also on hand stitching up a storm, helping visitors sew their own suffragette rosette. Visitors could also wander amongst our collection and discover more stories from the store. Before home time there was one more performance from Roland, telling the story of the Post Office Rifles regiment in the First World War. We run regular tours of the Museum Store but these sell out quickly. More tickets will be available next week so keep checking our website for details. From today until Friday 27th September 2013 our exhibition Last Post: Remembering the First World War will be on display at the Museum of Army Flying, Hampshire. 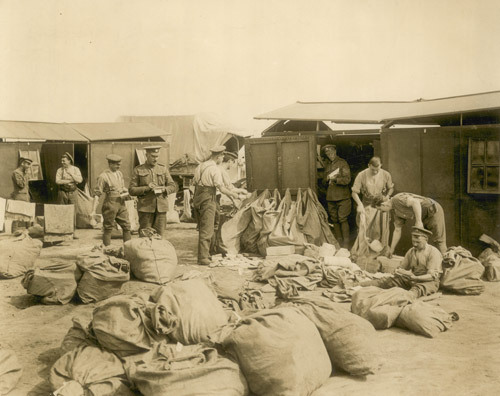 Last Post explores the effect of the events of 1914-18 on the Post Office and its people and the contribution of postal communications to the war effort. The First World War was a major turning point in the history of the Post Office. Many of the services that were reduced because of the war were never the same again. The volume of mail increased dramatically between 1914 and 1918, rising from 700,000 items in October 1914 to 13 million at its height. The Post Office actively encouraged their staff to join the war effort. Over 75,000 men left their jobs to fight in the First World War. 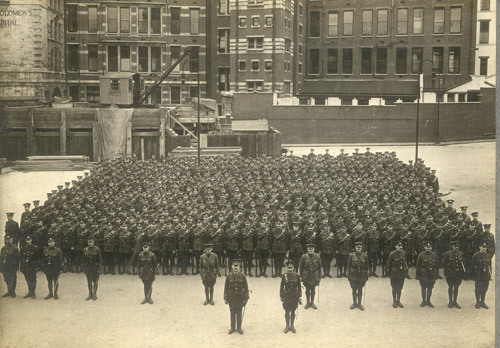 Of these, 12,000 joined the Post Office’s own battalion, the Post Office Rifles. Postal communications played a vital role in the war effort. 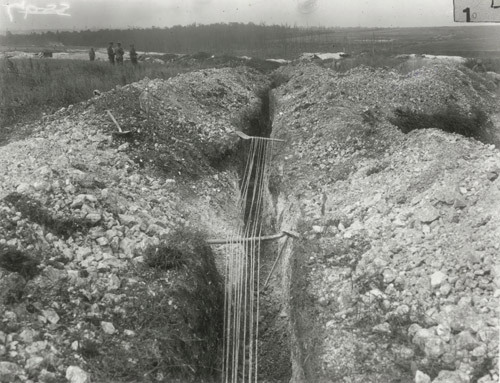 The Post Office set up telecommunications between Headquarters and the front line. It also ran an internal army postal system. During battle telegraphs and telephones were the main means of communication between the front line and Headquarters. Over 11,000 Post Office engineers made this possible throughout the war, using the skills they had acquired as civilians. Many soldiers had relatives and friends fighting in other units. From December 1914, the Post Office ran a postal service that carried mail between units. Writing and receiving letters and parcels were a vital part of sustaining morale and overcoming the boredom, which was a feature of trench life. 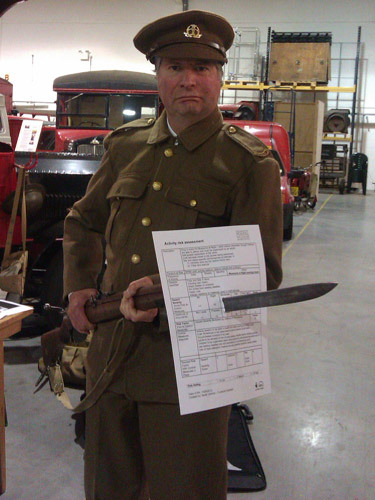 There is a charge for admission to the Museum of Army Flying, with entry to Last Post included in the admission price. For more information on opening times and prices please see the Museum’s website: www.armyflying.com. Last Post at the Museum of Army Flying is the first stop on its tour, as we move towards the commemoration of the centenary of the beginning of the First World War in 2014. Our twin exhibition version of Last Post is to be exhibited at Aysgarth Railway station heritage site, North Yorkshire, for the weekend of 4th to 8th May 2013. On leaving the Museum of Army Flying in September 2013, Last Post is then being exhibited for the month of October at the Guildhall Library, London. Also in October 2013 its twin exhibition version will be at Bletchley Park, Buckinghamshire. From Spring 2014 our flagship Last Post exhibition will be on display for a year at Coalbrookdale Museum, part of the Ironbridge Gorge Museum Trust site, accompanied by loans from other museums and organisations. Last Post is also being exhibited at Mansfield Museum from April to June 2013, Guildford Museum from June to September 2014 and finally Brading Roman Villa on the Isle of Wight from September to December 2014. If you would like to share your feedback on Last Post or for more information on any of the exhibition dates, please contact the BPMA Exhibitions Officer on dominique.gardner@postalheritage.org.uk. View our online version of Last Post: Remembering the First World War on our website. 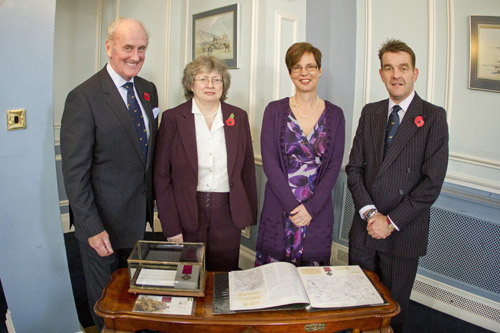 On Saturday 3rd November 2012, I was fortunate enough to attend a reunion event at the home of the British Forces Post Office (BFPO). This was held to commemorate the organisation as a whole but specifically the Battle for Wurst Farm Ridge, Ypres, Belgium, in which the 2nd/8th Battalion London Regiment, known as the Post Office Rifles took part. Many serving members of the modern day BFPO and Postal and Courier Services Officers’ Association were also present to remember their predecessors’ actions. In 1917 the company was sent to Ypres and in September they began training for what was to be the Battle for Menin Road Ridge. Their objective was to capture a portion of this ridge, known as Wurst Farm in attempt to cut the Germans off and force a surrender. One of the prominent individuals in this battle was Sergeant Alfred Knight, from the Engineers Department of the Post Office. 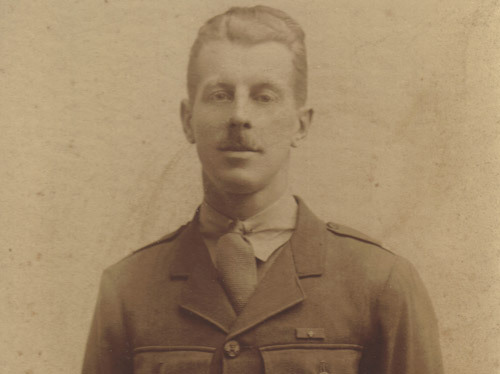 Knight had joined the Post Office Rifles at the outbreak of World War One in 1914 and served throughout the war along with other Post Office volunteers. He rushed through our own barrage, bayoneted the enemy gunner, and captured the position single handedly. Later, twelve of the enemy with a machine gun were encountered in a shell-hole. He again rushed forward by himself, bayoneted two and shot a third, causing the remainder to scatter. Subsequently, during an attack on a fortified farm, when entangled up to the waist in mud, and seeing a number of the enemy firing on our troops, he immediately opened fire on them without waiting to extricate himself from the mud, killing six of the enemy. It was these actions that earned Sergeant Knight the Victoria Cross, the only Post Office rifleman to achieve this, the highest British Decoration for Gallantry. The medal is now in the BPMA’s collection along with other medals won by Knight throughout his service. As part of the day, the BPMA arranged for the Victoria Cross to be displayed alongside BFPO’s painting by Terence Cuneo, showing Knight in action at the battle. These, coupled with Ann’s account of her grandfather really made the day a very special one and many thanks to both her and Major Chris Violet at the BFPO for making it so. BPMA Curator Emma Harper prepares Sergeant Alfred Knight’s Victoria Cross for transport to the event. Amongst those posing with the Victoria Cross are (left to right) Anne Walsh (Sgt Knight’s grand-daughter), Ann Turrell (Post Office) and Col Stephen Heron (BFPO). 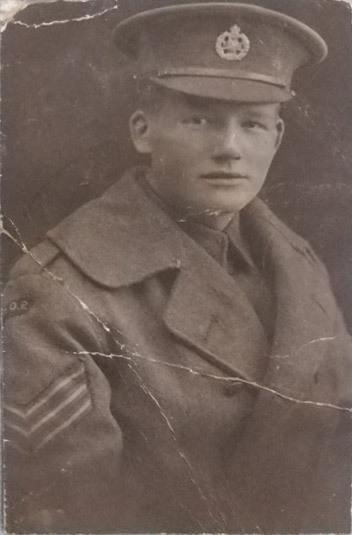 The Post Office Rifles were a remarkable unit and it is important that their role, and stories such as Alfred Knight’s, are remembered. It is perhaps one of the lesser known aspects of the history of the postal service and really highlights the breadth and depth of BPMA’s collection. It is treasures such as these that we hope to be able to share with the public in our new home in Calthorpe House. The exhibition Last Post: Remembering the First World War can be viewed online, and will be on display at the Museum of Army Flying, Hampshire from 25 March – 27 September 2013, and Aysgarth Station Heritage Site, North Yorkshire 4 – 8 May 2013. 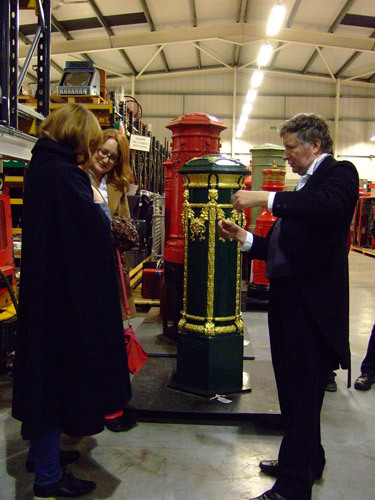 This year will be an exciting year at The British Postal Museum & Archive. While many staff are working hard to develop our new museum and archive others are continuing to organise events and exhibitions. The first of our talks takes place next month and features Chris West, author of First Class: A history of Britain in 36 postage stamps. In his talk Chris will discuss the book and go in depth on some of the stories. Last year Chris wrote a blog for us about how he came to write his book, and you can buy a copy from our online shop or purchase one at the event. 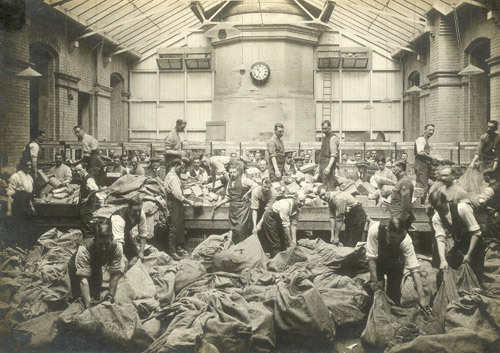 In March Oliver Carter-Wakefield of Kings College London will speak on Illness and Absence in the Victorian Post Office. Consumption, necrosis and mental derangement were just some of the reasons Victorian postmen called in sick – and they weren’t always skiving! Postal Mischief with David Bramwell. In April David Bramwell will present a slide-show talk on how the postal system was used for the purposes of mischief making, and in June BPMA Curator Emma Harper will explore a less weird but just as wonderful use of the Royal Mail when she explores the culture of letter writing in 19th and 20th Centuries. Tickets for all our talks are only £3.00 (or £2.50 concession) and can be booked online. Our ever popular tours will be held throughout 2013. Bookings are now open for three tours of the Royal Mail Archive and six tours of our Museum Collection. These guided tours are led by our archivists and curators, who will give you a rare behind the scenes look at our collections storage facilities and an insight in to what they care for. Book now for these tours as they sell out quickly! Walking tours of postal London run once a month and are operated by our partners Cityguides. Tours start at Farringdon Station and end at Bank, taking you in to the City of London which was once the heartland of the British Post Office. There is no need to book for these tours – just turn up on the day. See our website for details. See the sights of postal London on our walking tours. The Museum Store, where we are house our full of collection of pillar boxes and vehicles, will play host to two special events this year. The first, Pillar Box Perfection, taking place on 6 April, will offer a range of activities for all ages based around the iconic pillar box. The second, Museums at Night at the Museum Store, is part of an initiative taking place in May in which museums stay open in the evening. We’ll tell you more about this event nearer to the time. Both of these special events are free of charge. Visitors to the Royal Mail Archive in London can still see our Diamond Jubilee display of stamps from the reign of Queen Elizabeth II. We also have a permanent exhibition, The Museum of the Post Office in the Community, at Blists Hill Victorian Town in Shorpshire. The Museum is located above a recreated Victorian post office – a fascinating place to visit in itself – and is free to visit as part of your entry to Blists Hill. Part of our much-loved collection of General Post Office posters from the 1930s-1960s will go on display at the Great Western Hospital, Swindon in March. This is part of the Paintings in Hospitals scheme, and the public may visit the exhibition in the Hospital’s designated display area during their opening hours. Please pack parcels very carefully, poster by Tom Eckersley – this will be on display as part of Designs on Delivery. Also on tour is our exhibition Last Post: Remembering the First World War, which can be seen at the Museum of Army Flying, Hampshire from March and at Aysgarth Station Heritage Site, North Yorkshire in May. 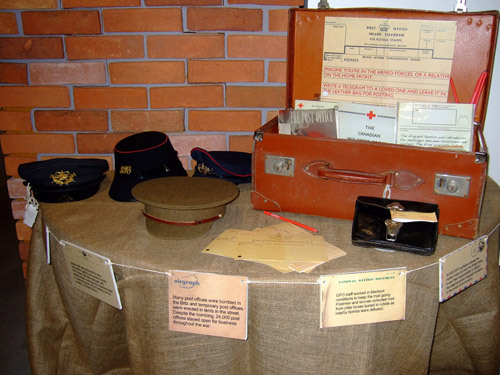 The exhibition looks at the role of the Post Office during the Great War. Visit our website for full details of our programme of events and exhibitions.